Located between the sea and the Cevennes hills, Nîmes is one of the most attractive towns in Mediterranean France. The city was established by the Romans, on the edge of the Mediterranean plain, some twenty-five miles inland from the sea; and to this day, Nimes has the finest collection of Roman remains in France. Apart from its Roman remains, Nimes is worth visiting for its attractive old town and its gardens, as well as its ideal location for discovering the Cevennes national park to the north or the renowned wetlands of the Camargue to the south – not to mention the large number of historic sites and other sights to be discovered in this part of Mediterranean France..
Nimes is located on the main Paris - Lyon - Barcelona route, and also on the Mediterranean coastal route between Italy and Spain. It is served by the A9 / E15 motorway and the A54 / E80 route from Marseille. It can be reached by direct TGV high-speed train from Paris, Lille, Strasbourg and Lyon. Nimes airport is served by only a few flights each day; but the city is fifty miles from the large airport at Marseille-Provence. Nîmes, capital of the Gard department, is a popular tourist destination, notably on account of its Roman remains, and its attractive old town. First and foremost among the Roman remains are the Maison Carrée, the best preserved Roman temple anywhere, and the mighty Arena, one of three large Roman arenas in the south of France. Apart from these two major monuments of classical antiquity, Nimes has several other Roman remains, in particular the Temple of Diana and Tour Magne, a Roman tower that was once a part of the city's outer fortifications, and now stands at the top of the Jardins de la Fontaine, overlooking the town. The Nimes arena - though 2000 years old - is still used as a venue for events today, including concerts and French bull-fighting, a version of the Spanish tradition in which the bull is not killed. The list of Nimes' Roman remains would not be complete without a mention of the imposing Pont du Gard (see Roman France), one of the finest remaining Roman aqueducts, ten miles to the northeast of the city. This remarkable structure was built by the Romans to bring water to the city. Apart from its Roman monuments, Nimes has an attractive and well preserved historic centre, with narrow streets and tree-lined boulevards typical of the south of France. The park of the Jardins de la Fontaine, laid out in 1745, is one of the oldest city parks in France, and a delightful area of greenery, fountains and shade on the edge of the old town. The cathedral of Notre Dame & St. Castor partly dates back to the twelfth century, but was largely rebuilt in later centuries - as were Nimes' other churches. Nimes has several small museums, the most notable of which are the Natural History museum, on the Boulevard Courbet, and the Archeological museum ; but both of these museums are in serious need of modernisation. Nimes is located in Languedoc , one of the most popular tourist regions in Europe - but also close to the border with Provence. Indeed, in classical times, Nimes and its area were all part of Provence, and the classical heritage of the Nimes area is part of an ensemble on either side of the Rhone . In addition to the above-mentioned Pont du Gard, the area round Nimes offers plenty more in the way of classical remains - including the Roman Arena at Arles, and the magnificent Roman amphitheatre and triumphal arch at Orange. The area is also rich in historic monuments from the Middle Ages and the Renaissance, the most notable of which ate the Saint Trophime church at Arles, the Papal Palace at Avignon, and the medieval bastide port city of Aigues Mortes, just southwest of Nimes, from where the Crusaders set off for the Holy Land in the middle ages. Nimes is also a handy base for discovering the beautiful natural landscapes of the south of France, including the Cevennes National Park, to the north of Nimes; for the scenic "Corniche des Cévennes" route, check out Byroads through the Cevennes. Nîmes is also close to the wetlands of the Camargue to the southeast - a UNESCO biosphere reserve famous for its pink flamingos, its wild white horses, and aquatic wildlife. Fifteen miles east of Nimes lie the twin towns of Tarascon and Beaucaire, either side of the Rhone, with their medieval castles standing guard over the river. This was the point at which the Roman Via Domitia - the route from Italy to Spain, crossed the Rhone. Beaucaire has an interesting troglodytic abbey, carved into the hillside. 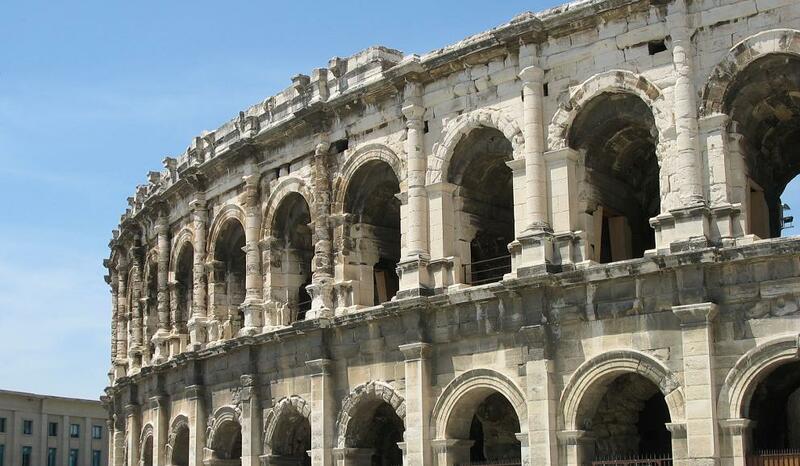 Photo top of page : the Roman arena in Nîmes, the finest in France - and still used today. Main sites: Roman arena, Maison Carrée roman temple, Tour Magne. Nearby attractions: Pont du Gard, Arles, Tarascon, Aigues Mortes, Camargue, Cévennes.